(AP) -- Yahoo Inc. is delivering on its promise to boost its earnings even though a bumpy beginning to its Internet search partnership with Microsoft Corp. is causing it to fall further behind in the Web's most lucrative advertising market. Despite the Microsoft problems, the results released Tuesday showed signs of progress, which could help Yahoo CEO Carol Bartz persuade skeptical investors that the company is getting better after years of financial infirmity. Yahoo hired Bartz in January 2009 to revive revenue growth, a goal that has proven elusive so far. She spent most of the first two years on the job cutting and reshuffling staff, closing unpopular services and cobbling together the Microsoft alliance to reduce Yahoo's costs. Yahoo's higher earnings have come from primarily from savings that have included paring the company's staff to 13,300 employees, a 6 percent decrease from 14,200 people a year ago. Investors generally prefer to see robust revenue growth, particularly in companies trying profit from an Internet ad market that has been expanding at a much faster rate than the overall economy. 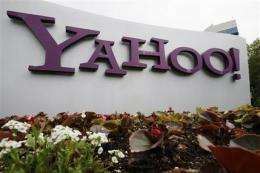 Those expectations mean Yahoo eventually will have to increase its revenue if it hopes to restore investors' confidence. Facebook's increasingly popular online hangout also has been luring visitors and advertising from Yahoo, posing another serious threat for Bartz to confront. The results released Tuesday showed a 10 percent revenue increase in Yahoo's stronghold - the online billboards known as display advertising - after subtracting commissions. Earnings exceeded expectations, as did another gauge followed closely by Wall Street. "Our turnaround is proceeding on schedule," Bartz assured analysts in a conference call. "We are very confident we are headed in the right direction." But an upturn in revenue isn't imminent, partly because the Microsoft alliance isn't providing the payoff that Bartz envisioned. Yahoo's forecast for the current quarter pointed toward revenue slipping again for the three months ending in June. Investors appeared willing to settle for the earnings improvement while they await a revenue revival. The company's shares gained 50 cents, or 3.1 percent, to $16.62 in extended trading. With Yahoo's revenue slipping below its levels before Bartz's arrival, the company's stock has been a lackluster performer. The shares have fallen by more than 40 percent since Google Inc. went public in August 2004 and proceeded to establish itself as the dominant force in Internet advertising. At the time of Google's IPO, Yahoo's stock stood at $28.11. Since then, Google's market value has increased by more than fivefold. Measuring Yahoo's strides in the first quarter proved difficult because of various one-time gains and charges that muddled the comparisons to last year. Yahoo earned $223 million, or 17 cents share, for the first three months of the year. That's a 28 percent decline from $310 million, or 22 cents per share, a year ago. If not for unusual items, Yahoo said it would have earned 19 cents per share in the latest quarter compared with 15 cents per share a year ago. Analysts surveyed by FactSet expected earnings of 16 cents per share. That meant Yahoo topped the expectations guiding Wall Street, no matter how the earnings were chopped up. Yahoo's revenue fell 24 percent to $1.21 billion. That decline is deceiving because it reflected the divestiture of some divisions and accounting adjustments dictated by the Microsoft partnership. In a gauge followed more closely by Wall Street, Yahoo's revenue came in at $1.06 billion after subtracting ad commissions. Although that was $10 million higher than analyst estimates, it was 6 percent below $1.13 billion on the same basis last year. In a long-running problem, Yahoo is still losing ground in search - an advertising gold mine that Google dominates. Part of the decline stems from Yahoo's financial arrangement with Microsoft. The deal calls for Microsoft's technology to provide Yahoo's search results in return for $12 of every $100 in revenue from the ads placed alongside the recommended links. But Bartz said the Microsoft partnership isn't delivering as much revenue per search as the two sides envisioned. Until the trouble is worked out, Yahoo is delaying its plans to rely on Microsoft's search ad system outside the United States. Bartz didn't quantify how much Yahoo's revenue per search in the U.S. is lagging projections. She said guarantees promised under Yahoo's contract will cover some of the shortfall through March 2012. After taking out commissions, Yahoo's ad revenue from search totaled $357 million in the first quarter. That was down 19 percent from the same time year ago. Yahoo, which is based in Sunnyvale, Calif., fared better in display advertising as net revenue in that category increased to $471 million. Combined, Yahoo's ad revenue after commissions dipped 3 percent from a year ago to $828 million. Google's net ad revenue surged 32 percent to $6.3 billion in the first quarter. Google's stock, though, has plunged since the company released its first-quarter report because its expenses are rising rapidly.